Despite the huge hype surrounding the highly anticipated event, only a handful of residents from the area turned out. 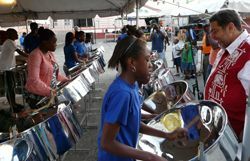 The brainchild of Prime Minister Dr Ralph Gonsalves, Pan Against Crime seeks to steer the nationâs youth away from a life of crime and into the realm of music, namely the steel pan. So far, over six steel pan sides have been established throughout the length and breadth of St Vincent and the Grenadines. Speaking at the ceremony on Sunday, Prime Minister Dr Ralph Gonsalves said that the programme has been working wonders, as more young people are getting involved in playing pan. Dr Gonsalves also noted that he wants more communities to get involved with the Pan Against Crime initiative and make positive things happen. Dr Gonsalves stressed the importance of the involvement of the contributions of the Anglican Church, which has been instrumental in the development of the Paulâs Avenue area. He said that the church allotted portions of their land to build the Kingstown Technical Centre and to improve the conditions of the playing field. The Prime Minister also praised the work of the Social Investment Fund (SIF) for the tremendous work they have been doing in helping to sponsor the pan sides. Marlon Stevenson, president of Avenues United, said that there is a responsibility to give the children hope for a better tomorrow. âWe often judge and complain about our youths… and that it is time they are given a chance.â Stevenson asked the gathering to let the project of rebuilding the football field be one of cohesiveness and a step in the right direction.